I baked my very favorite cookies yesterday...whipped shortbread..I doubled the recipe because Im going to Edmonton to visit my Grandpa and I wanted to take him some, but I still wanted my own...I spent the afternoon making, baking and decorating with teenie tiny little candy cane shaped sprinkes....they were perfect. 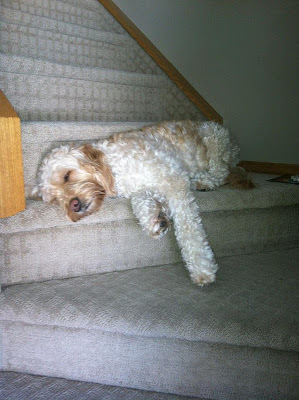 I left a full extra large tray on my kitchen table to cool, then left to meet Mad on her walk home from school....Well...things got busy...This morning I woke up with "damn, I forgot about the cookies". I went downstairs to find an empty tray..."Aww..The Mister put them away after I fell asleep on the couch..whata sweetheart" or so I thought...when I gave my smooches and said my thank yous as he was leaving for work...he had no idea what I was talking about....not a clue...Do you know what that means? Once up on a time, there was a tray of fresh baked shortbread cookies...then a dog came. The End. I *thought* at first, it was a team operation...the 2 dogs working together....I even thought maybe the cat got involved....but once I laid out breakfast, Piper was the only one not eating....Busted. So earlier this week, my mum drove up to drop off the dresser she bought for my Grandpa, to put in his new place. I love how it turned out. Its distressed and dark waxed to add some age. I had 3 days, but I got it done in 2..a personal best. Whoop! My Grandpa gets it tomorrow....Im very excited to know what he thinks about it. Also, notice the one of a kind work of art? My Bunny did that crayon masterpiece! Its stunning! We had so much fun making it!! We're fighting at the moment on who's room its going to hang in. make 47 more...one for sure, will be coming to adorn Grandpa's wall too..
poor baby, looks like he's in a sugar coma from all the cookies! dresser is fabulous! 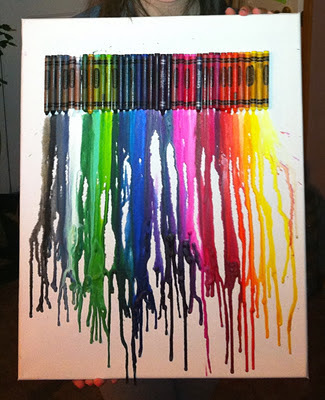 Crayon art is beautiful!